Here's how some libraries are serving customers with free software. Replace that troublesome closed mail and calendar server. 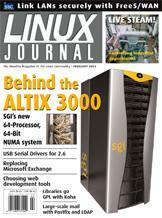 Find out how the Altix 3000 happened, and how it's performing. The optimizations and features of Intel's complier for the IA-32 architecture. Here's a flexible solution for hosting mail for many domains on one server. Kids at the Greater Houlton Christian Academy are growing up with Tux. Small, convenient cameras are especially vulnerable to the dreaded red-eye effect. Fix it. From safety controls to a convenient web front end, Linux is an essential part of this lab.